Heat butter in a pan,add cloves,cardamom,cinnamon,black cardamom,star anise,bay leaves,onion, ginger garlic paste & saute few mins. Add mint leaves,peas, g.chillies & mix well. Add soaked rice + 3 cups of water & cover the lid & add the fried paneer & check the seasoning. Allow to cook until done & serve hot with any curry dishes. wow thats a good platter.Love the rice. @ Renu,neema - thxs for ur quick comments. @vidhya- thxs dear. Try and let me know how did it come. LOoks wonderful,my kid will lov this! panner pulav would definitely a party treat na..looks nice..
i dont fry the paneer pieces...just add them as it is..looks so delicious..
Wow i have never made pulao in the electric cooker. This one looks really yummy. Sri, Naanum Priya kooda varappoaraen!! Very nice pulav!! 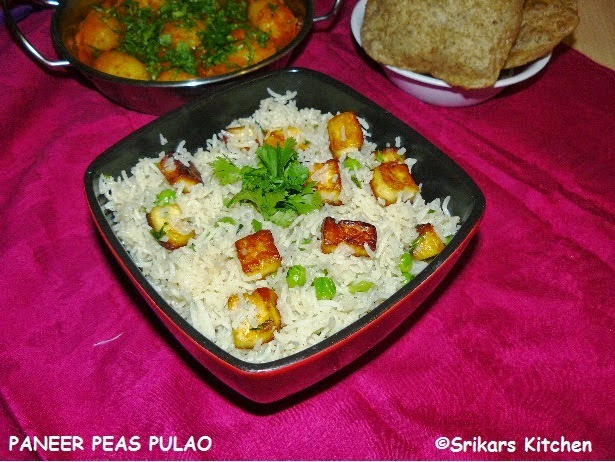 Lovely recipe with paneer, looks delicious. @ priya ,Lata Raja- kandippa vanga always welcome..
oh..paneer pulao looking great n colurful yaar..
That's a neat idea to include the paneer in the pulao. Yummy recipe! Love the presentation!